What’s on your workout playlist? 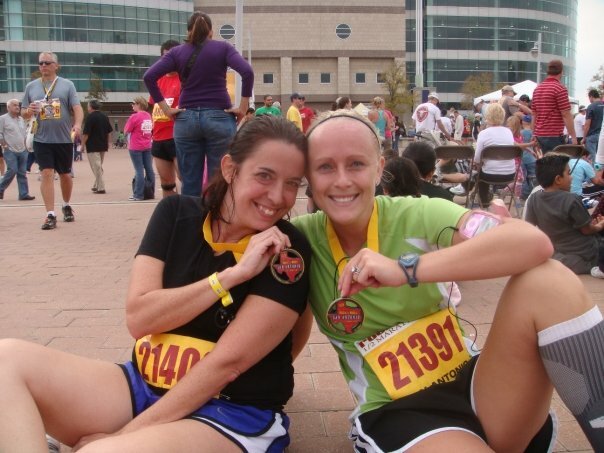 Me and Mindy after the San Antonio Rock n' Roll Half-Marathon in November 2009. Okay, kids. I need your help. Training for the half-marathon (because I need pre-training training!) has begun in earnest. It’s exactly five months from today, so it’s time to start getting motivated. Of course, it’s hotter than blazes outside and I didn’t go out until 10:30 AM this morning, so after only two miles, I looked like a giant purple beet, but at least I got out there, right? However, I’m going to need motivation to get through the summer months – did I mention I live in North Carolina and it is rather reminiscent of a sauna in Hell come July and August? Which brings me to my point…musical motivation. I need it. I crave it. I want new stuff. So, I started piecing together my Summer Running Playlist this morning. Creating a running playlist, like all of my Krissie Mixes, takes forever for me to get right. And I have to have songs that have words – I can’t do all those techno-housey songs that go on forever with just beats. My perfect mix builds up slowly (for pacing purposes), and then gets really rocky and rhythmic in the middle, slows down a bit, and then has a killer finish so I end on a high note. And I’ll admit, I have my favorites that make their way onto every mix – Moby, Luna Halo. And there’s stuff on my running playlists that would probably shock some folks – New Kids on the Block, Pink, totally Top 40 stuff. Hey, if it’s a good running song, it’s a good running song! I’d like to get this playlist up to about two hours and twenty minutes worth of serious running music. I’ve got tons, but I need some fresh blood! What are your favorite workout songs? Bring ’em on! Nothing is off limits! Post your recommendations as comments or shoot me an e-mail. Can’t wait to hear what music I should be running to…. This entry was posted in Music, Running by Krissie. Bookmark the permalink. Supercalifragilisticexpialidocious – Harry Connick Jr. I am training for a half in August (Providence) and also signed up for the Chicago Marathon in October. So I am going through this too Krissie. Here are some suggestions off my list I think you might like (and have). Hope some of these help! Ben, Raincoat and Gypsy Woman are regulars on a lot of my running mixes, too. It’s that pounding, driving beat that makes for a good running song, no? I’ll check out some of the ones I don’t know on your list. I think you probably have most of these already … hope this helps, and good luck!